Some of my favorite articles in the Miami Herald are part of the “Miami Stories” series. Recently, while reading the story provided by Joe Gautier, it was clear that this was more than just a story detailing memories of growing up in Miami. The Gautier family arrived in Miami around the time of incorporation and were part of the first business community and development of early Miami. 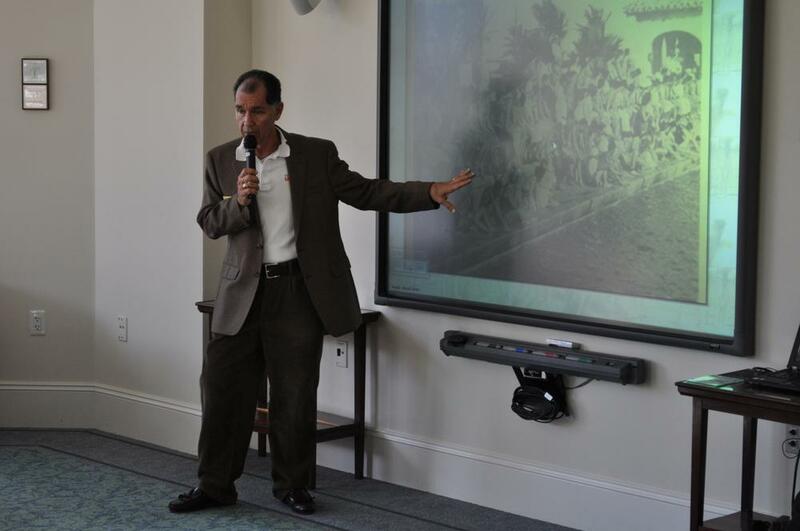 While it is very interesting to learn about Miami’s history through books, archived newspaper clippings and photo sites, there is no substitute for oral history. Many memories of early Miami were interviews with family members of early pioneers. The Gautier story inspired me to find out more about the family and the details provided in Joe Gautier’s account in “Miami Stories”. E.V. Blackman provided one of the best accounts of Miami pioneers in his book called “Miami and Dade County Florida”. Blackman provided a biography and a list of accomplishments of the men and women who formed a city out of a wilderness. In his book, Blackman stated that T.N. Gautier arrived in Miami from West Palm Beach in 1896. However, Joe Gautier’s account had his grandfather arriving in Miami from Crescent City, Florida in 1895. Crescent City is closer to Jacksonville than it is to West Palm Beach. Regardless of the timing and point of origin, T.N. Gautier arrived at a pivotal time in Miami’s history. Gautier was one of 500 signatures needed to file for incorporation. Gautier also started one of the earliest businesses in Miami. Miami’s first business district settled along Avenue D (later named Miami Avenue), jetting up north from the Miami River. 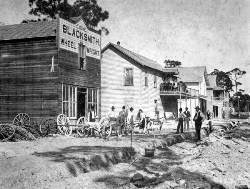 Gautier opened a grocery and dry goods store along Avenue D, next to C Cone Blacksmith in 1897 (see picture). As evidence of how early Gautier was in establishing his business, the very first telephone directory in Miami was one page, and “Gautier, T.N. Groceries” was one of the businesses listed. One could simply dial “9” to reach the store. In addition to the grocery and dry goods store on the ground level, Mrs. Gautier opened a boarding house on the second floor of the business. Rooms to rent in Miami were very scarce in the mid-1890s and most enterprising Miami pioneers found a way to fill the need for those who needed a place to stay. Mrs. Gautier called the boarding house “The Gautier”. It became such a big part of the family business that the 1908 Miami City Directory listed the occupation of the T.N. Gautier as proprietor of “The Gautier”. There was no mention of the grocery and dry goods store. Based on an advertisement in the 1908 Miami Metropolis, it appears that “The Gautier” moved from Avenue D to a nearby location. The advertisement listed the boarding house at the corner of Avenue C and Ninth Street. By today’s addresses, it would have been located at the corner of NE First Avenue and NE 3rd Street. 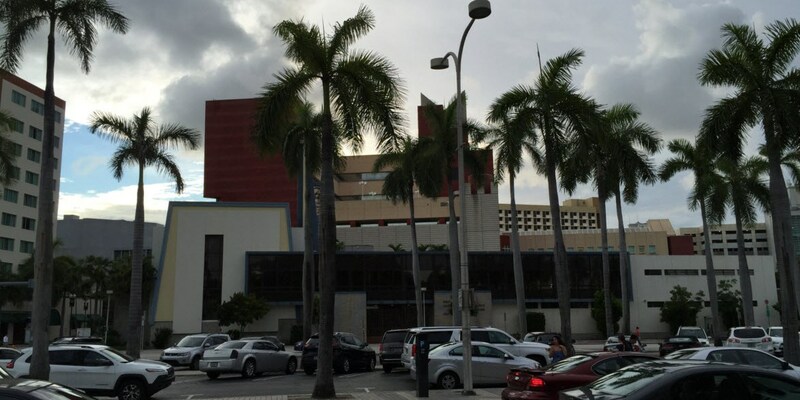 This location is now part of the Miami-Dade Community College downtown campus. The Dirty Dozen at Royal Palm Hotel Garden in 1910. Gautier was third from the right. T.N. Gautier Jr. was ten years old when his family moved to Miami. T.N. junior was Joe Gautier’s father and was a member of a group that was referred to as “The Dirty Dozen”. 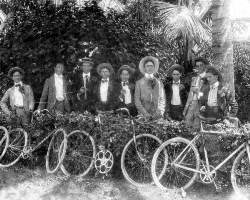 The group included many prominent business leaders in Miami in the first half of the twentieth century. In addition to T.N. Gautier Jr., the group included Roddy Burdine, Freeman Burdine, Robert Coates plus several others. The picture shows the Dirty Dozen as teenagers spending time in the Royal Palm Hotel garden. It isn’t clear if this group was given the name as teenagers or later in life. The picture would indicate that the group was referred to by this name as young adults. Regardless of the meaning of the name or when it was assigned, many of its members would go on to become prominent businessmen in Miami as adults. The Gautier family was very involved in the establishment of the Methodist Episcopal Church. The Church was organized in 1898 by Rev. Fred C. Blackburn. Around the time of its founding, a wooden church building was erected at the corner of Avenue C and Eighth Street. The land was donated by Henry Flagler. The Gautier boarding house would be located just one block south of the church in the early part of the 1900s. Among those who were pivotal to the formation of the church were Dr. James Jackson, T.N. Gautier and family. Some of the other prominent members in the first roll book were W.M. Burdine and S.A. Belcher of the Belcher Oil Company. Prior to the church erecting their first building, services were conducted out of a tent on the property donated by Flagler. T.N. Gautier Jr. remembered when the tent was used as housing for soldiers training in Miami in 1898 during training for the Spanish American War. Henry Flagler offered the newly created city as a training camp for the war effort. The Royal Palm Hotel was used for officer’s quarters, and land north of the hotel was used to house enlisted men. The area was known as “Camp Miami” during this time. The church’s tent was part of Camp Miami. Gautier Jr. was quoted in a May, 1960 story in the Miami News recalling the early years of the church: “I remember when the land on which the church now stands was a tented city. During the Spanish American War, soldiers, six regiments of them, were camped all the way from the bay to past where the church is today”. Gautier Jr. went on to say he remembered the apathy on the part of the soldiers. When the church members asked for help to build the tent, the soldiers refused and went back to shooting craps. T.N. Gautier Jr. was 13 years old in 1898. As the first two decades of the twentieth century progressed, the congregation for the church grew rapidly. It grew so rapidly that they needed to build a new and bigger church. Plans were made to erect a new church in the same location as the existing church. At this time, the church began to be known as the Trinity Methodist Episcopal Church, South. 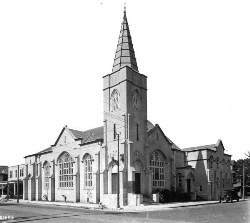 There are two accounts of when the new Trinity Methodist church was completed. One account had it being built and ready for use by 1915. However, E.V. Blackman listed the construction date of the new church in the 1919 – 1920 timeframe. Regardless of the year, the new church was located at 401 NE First Avenue (formerly the corner of Avenue C and Eighth Street). The new church provided a modern and spacious look and layout to provide ample room for the growing congregation. Several years earlier, a northern congregation known as the White Temple Episcopal Church moved into its new structure. The White Temple church was anchored with a 150 pound, four foot thick white cross on the church’s dome at the top of a 95 foot tower. The two congregations decided to merge in 1966. Following the merger, the joint congregation was known as First Methodist Church of Miami. There was a fire at the White Temple Episcopal Church around the mid-1960s that may have facilitated the merger between the two churches. The White Temple congregation joined services in the Trinity Methodist church at 401 NE 1st Avenue following the merger of congregations. By April of 1970, the White Temple Church, which was built in 1913, was demolished to make room for a new junior college which we now know as Miami-Dade College. One of the big issues during demolition of the White Temple Episcopal Church was the preservation of the white cross at the top of the church dome. The cross was designed by William J McDougall and it was put on the church tower in 1923. The problem was that the white cross was tightly integrated with the 95 foot tower and the demolition crew felt there was no way to remove the cross from the dome safely and without damaging it. However, during demolition, the cross broke free from the church dome on its own as the tower started to crumble. The cross landed far from padding laid out to catch it as the tower fell. Despite falling close to 100 feet, it landed safely with only minimal damage. The cross was repaired and preserved for future use. In addition to the cross, church officials made it a priority to preserve the chimes as well. The chimes were dedicated to one of Miami’s Pioneer Methodists, Edwin Nelson, in 1923. This was the same year that the cross was put on top of the tower. Edwin Nelson was the first furniture retailer and provided the first funeral service business in Miami. His store opened the same year Miami was incorporated. His business would also be listed in the very first one page phone directory. Nelson would sell his funeral service business to Walter Combs in 1906. The Comb’s Funeral Home served Miami from 1906 to the 1960s, when it was merged with several other funeral homes. Until that time, Combs would brand itself as Miami’s first and oldest funeral home. Following the demolition of the White Temple church, the combined congregation conducted services at the former Trinity Methodist church at 401 NE First Avenue in downtown Miami for the next decade. Whether it was the expansion of Miami-Dade College or a need to modernize the church, First United Methodist choose to build a new church in the late 1970s. The new church was erected at 400 Biscayne Boulevard and completed in 1981. The structure at 401 NE First Avenue was demolished soon after the move of the congregation to the new church. According to a recent photo, it appears that the former White Temple Church cross, preserved in the demolition of the old White Temple Church in 1970, was placed on top of the new church at 400 Biscayne Boulevard. However, the cross was moved later and is currently displayed within the courtyard of church built in 1981. The former location of the old United Methodist Church on First Avenue is now part of the Miami-Dade Campus. Joe Gautier described his earliest memories growing up in Miami in his “Miami Stories” edition in the Miami Herald. As a third generation pioneer, he recalled the 1935 hurricane and what his family had to do to weather the storm. He remembered walking to Roddy Burdines Stadium in 1946 to attend a Seahawks game during their lone season in Miami. Joe was born in Victoria hospital in 1932 and graduated from Miami High in 1950. He met his wife, Miriam, also a Miami High graduate, and raised his children in Miami. As one reads his recollection growing up in Miami and the accomplishments of his forebears, it is easy to see why he remained when so many others left. His final thought in the article was “living in Miami taught me about living through hurricanes, traffic, hot weather and mosquitoes. Miami, to me, was a great city to grow up in”. While not all of today’s residents can say they grew up in Miami, those of us who enjoy living in here today can say that we still endure “hurricanes, traffic, hot weather and mosquitoes” as the price we pay for living in our slice of paradise. 9 Comments on "Gautier Family and First United Methodist Church of Miami"
My husband and I have really been enjoying your “Miami-History” articles. My parents came to Miami from the north in 1926, and his came in 1932 from Ft. Myers. My memories are abundant and cherished. Thank you for sharing the stories of others. Sylvia Greene Camp ( husband Dr. Robert J Camp). Thank you for your kind words Sylvia. I always enjoy hearing the stories of those who have been in Miami for multiple generations. Hi, Casey. I forwarded your column to Ed Fleck who may send the website address to several hundred Miami High graduates on his StingTrain (all about Miami High e-mail service). Does he have permission? I hope so. It was a great followup to Joe Gautier’s Miami Story. Thanks. Bill, Ed is already receiving my newsletter and he has been very gracious about forwarding stories he finds relevant to the StingTrain. Both my father (class of ’58), and grandmother (class of ’32), were proud graduates of Miami High. Joe, I found an interesting article in the Miami News from 1917 about The Gautier Apartments. Please send me an e-mail at casey@sfwebnet.com and I will send it to you. Thank you very much for posting this article. Writing and/or reading about the history of a place is a sign of respect and admiration for those who came before us. The white cross that you speak of is still at the church! Please fact check as this statement is wrong, “However, the cross cannot be found on the church as of this past week..” One only has to go inside the courtyard of the church and see it in the lovely garden on church premises. Also, please tell Joe Gautier that perhaps his mother sang with Elizebeth Carter (alto). She was recently honored for her 60 years of service to the church! I was born Paula Hutson and am the great niece of Dr. Thomas Hutson who married Ethel the daughter of Dr. James Jackson. I lived in Miami in two periods 1959 to 1964 and 1990 to 2000. For part of the 1990’s I lived in the Roads neighborhood (SW 18th Road) and was able to attend many of the Historic Miami meetings and went on various historic walking tours. During that time, I was also a member of the First Untied Methodist Church. My father William Hayes Hutson is buried in the Jackson/Hutson family plot in the Miami Cemetery.